Gloomy skies, a slight chill in the air and a little bit of of rain mean one thing: Rain boots. Days like this have been pretty rare lately, so naturally I jumped at the opportunity to wear my military inspired pea coat (A F21 find from 2 years ago), over my nautical inspired striped dress. Here's to hoping L.A. has more days like this to come! Such a great coat, I can't believe it's from F21! i invite to me too \!! Lovely look. The coat is pretty. Nice color on your hunters. =) Stripes and red or navy always go together no matter what kind of item it is. WOW What an Outfit, your striped Dress is groovy and I love your red Wellingtons, so adorable on your bare legs, I've been wearing my Wellingtons a lot lately, they look great with thin black Tights. Love the stripes with the red boots, so chic! Adorable combination :stripes and red Hunters=perfect ! You've certainly hit a winner with your Outfit, your navy striped Dress and red Rubber Wellingtons look perfect together and your Pea Jacket gives it that nautical look so well done. Adorable! Love the stripe dress and that amazing coat! This is so unbelievably cute! I wish I could look this put together on rainy days! you are too freakin cute. i'm so glad fall FINALLY arrived in LA - it was seriously getting annoying. you've styled this dress perfectly. can't wait to see more pregnancy style looks from you. Love the red rainboots, so cute!! And what a great way to bring summer's sailor stripes into the fall! Great outfit! 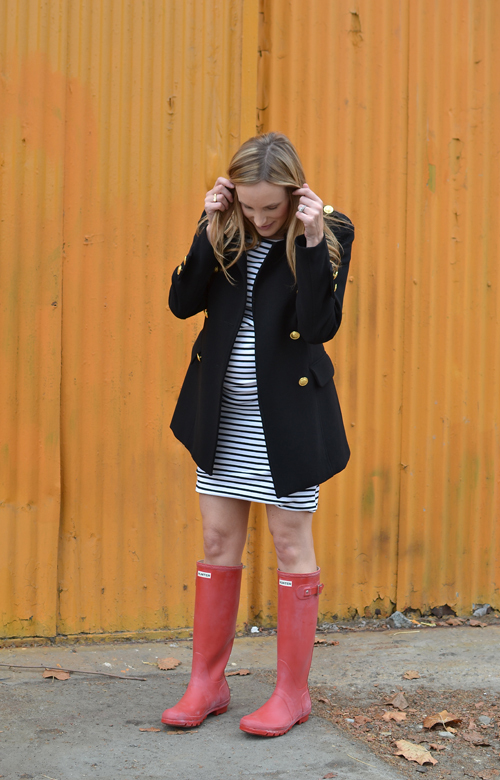 I love the rain boots with the dress and coat! If you could try to be a little cuter we would all appreciate it! ....JK! HOly cow you look amazing and this outfit is one of my favorites! I know I saw that a lot to you but they just keep getting better and better. That coat is a must have!!!! Could you be any cuter?! This is such a classic/cute outfit. Love the stripes and hunters! I agree, so ready for fall weather...finally! You make that coat look so luxe! Awww you're so cute in this look Audrey...plus its so comfortable for that bump!!! yay! we are stripes and military blazer twinsies today!!! I just got a similar coat and I love the way you combined it! Looking fab! Love this look! That dress is so cute and of course the boots are cute with it. so nice looking so nice i like it . Looking fab, by the way! !